It took me all 10 seconds to interpret my father’s email a few days before his visit. The Korean folk tale about dried persimmons goes something like this. Once upon a time, a mother was trying to calm her crying baby. She said, “if you don’t stop crying, a tiger will take you away.” The baby, now more scared at the thought of a tiger, cried louder. The mom was frustrated and didn’t know how to stop this mad crying from her son, so she gave in and said, “ok, if you stop crying, I’ll give you a gotgam (곶감; dried persimmon).” The baby, thinking of a sweet, soft gotgam, finally stopped crying. All this time, a tiger was eavesdropping from outside. When gotgam finally stopped the baby’s crying, the tiger said to himself, “this gotgam thing, whatever it is, must be something really scary, even scarier than me!” So the tiger ran away before the scary gotgam made its entrance. Gotgam is enjoyed mostly as is for a snack, but also traditionally used to make a spicy sweet cinnamon drink (수정과; su jeong gwa) and dried persimmon wrap (곶감말이; gotgam mari), often with walnuts inside. It is also used as an ingredient for cakes and cookies. For me, it seems that I never get enough to do anything else with it because the few I get on occasion disappear so quickly. The word gotgam is said to have come from got-da (곶다; old verb, to skewer) and gam (감; persimmon) because persimmons used to be dried skewered in twigs. The types of dried persimmons have evolved over time. From my childhood, I remember mostly the flattened, donut-shaped gotgam covered in white sugary powder that develops naturally in the drying process. Then over the years, I’ve seen different shapes of gotgam and tasted more variety in textures, yet with a consistently concentrated sweet flavor bursting in my mouth with each bite every time. Despite the plentiful gotgam I’ve eaten in my lifetime, I didn’t know how they transformed from persimmons to gotgam – other than the fact that some drying was involved. This time, as my dad and I were marveling over the gotgam he brought for me (one for dad, two for me…), I became curious. Here is what I’ve gathered on the general persimmon drying process. 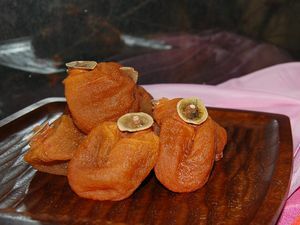 Gotgam are made with 70-80% ripe persimmons when they are still relatively firm and easy to peel with the shape intact. Starting in October each year, persimmons are harvested, sorted for blemishes, peeled, then dried for about 45 days hung in threads or special hangers made for drying persimmons. The ones sold as half-dried persimmons (반건시; ban geon shi) would obviously require less drying time. They are kept in tents or warehouses with exposure to the sunlight by the day and below freezing temperature by the night. 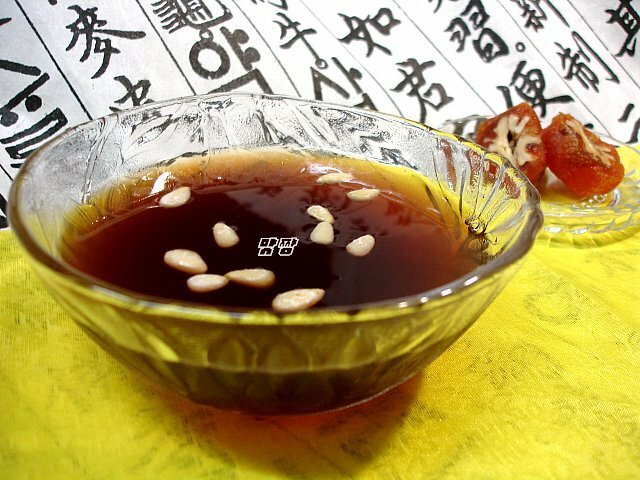 The continuous exposure to freezing then thawing with natural ventilation of wind allows persimmons to slowly dry and develop almost candy-like sweet flavor and moist consistency of a cross between jelly and coulis. Some drying method variations include controlling the level of exposure to the sunlight, massaging persimmons often throughout the drying period, shaping half-way through, and/or reshaping before packaging. Even with some automation (e.g., persimmon peeling machines) in some large gotgam towns in places like Sangju which is responsible for 60% of the persimmons produced in the country, the whole process is very labor intensive. The hanging, harvesting and packaging are mostly done by hand. Also, because persimmons are prone to develop mold at the contact with other persimmons and moisture (i.e., rain or snow), not to mention the impact of temperature, ventilation and humidity on the color and the quality of gotgam, the drying period of almost two months is about constant care. What I’ve come to appreciate as I was learning about the gotgam process is that this is really about how the best in a fruit comes out through patient human care combined with what the mother nature offers. Although Slow Food USA has put dried persimmons in the Ark of Taste, as one of over 200 foods in danger of extinction, I am glad to see that gotgam continues to get better in Korea. It is a popular winter holiday gift item reflecting its seasonal release, but also available throughout the year. Still, most of the country’s current production is consumed domestically, hence the reason we see so few of these even in Asian markets in the states. Although the price range reflects its laborious process, I wish we could find more gotgam in more markets. Commercially, persimmons are largely categorized into the sweet and the astringent kinds, then further divided into specific varieties in Korea. Both are used to make gotgam. – Widely known as Fuyu persimmon in the U.S.